Low-emissivity (Low-E) windows feature glass that has a thin coating on the glass within its airspace that reflects thermal radiation or inhibits its emission reducing heat transfer through the glass. This coating or film allows light in, but prevents some solar rays from being transmitted through the glass. Why should I buy Low-E windows? 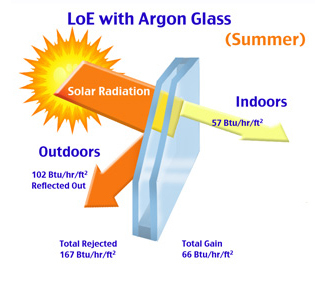 Low-E glass is an energy-efficient, high performance glass. Therefore architects, builders, and homeowners have the freedom to incorporate larger window and glass areas in their designs, without the resulting excessive energy costs. According to National Resources Canada ENERGY STAR certified window models can save you an average of 8% on your energy bills as compared to a standard window. And windows that qualify for the ENERGY STAR Most Efficient designation are up to 40% more efficient than a standard window. Reduce Heat Loss in Winter – Low-E glass reduces radiant heat transfer and reflects interior heat back into the room, not back outside. Reduce Heat Gain in Summer – Low-E glass reduces the flow of hot outside air into the cooler interior of your house in the summer. Lower Utility Bills – Low-E glass helps reduce the amount of heating and cooling energy needed to keep a house at a comfortable temperature. That means furnace and air-conditioning systems work less and that can add up to significant energy savings. Reduction of UV Rays – Low-E glass significantly reduces transmission of the sun’s damaging ultraviolet rays, one of the leading causes of premature fading and degradation of fabrics, upholstery and carpeting. Comfort – No one enjoys sitting near a cold, drafty window in winter. 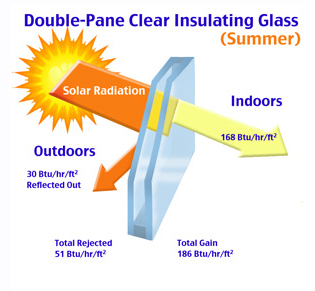 Low-E glass works to raise the inside glass surface temperature in winter. This can help to minimize cold spots and keep you more comfortable. Minimized Condensation – Low-E glass helps keep the inside glass surface temperature warmer, therefore providing a more comfortable, higher humidity level with greatly reduced condensation and fogging. Larger Window Areas – Low-E glass is an energy-efficient, high performance glass, architects, builders, and homeowners have the freedom to incorporate larger window and glass areas in their designs, without the resulting excessive energy costs. We offer a FREE no obligation quote where one of our sales associates will go to your home, and measure your windows, door, patio door, siding, and discuss various options and installation services. Please note that our stores will be closed on Good Friday, April 19. We will resume to regular hours on Saturday, April 20.